Le public est synchro dans le jump. According to Stuff.co.nz, estranged AC/DC drummer Phil Rudd was arrested again Saturday night (July 18) at his home in Tauranga, New Zealand. It is understood prostitutes were at his house at the time of the arrest. Rudd's lawyer Craig Tuck told Fairfax Media: "All I can say is he has been arrested and will be appearing on Monday at 10 a.m. in the Tauranga District Court. That's all I can say for now and that's all I am telling everyone who is calling." Rudd was sentenced to eight months of home detention earlier in the month in New Zealand's Tauranga District Court after pleading guilty to charges of attempting to "procure a murder" and drug possession. He faced up to seven years behind bars. Rudd's son submitted an affidavit to the court which said in part that his father "has a heart of gold and wouldn't hurt a fly. It's just when the drugs take over, he behaves how he taught me not to." Rudd has reportedly been struggling with a meth addiction. When his first solo effort, "Head Job", flopped, Rudd reportedly threatened a former employee. A month later, Rudd told an associate that he wanted him to "take out" his personal assistant, whom he then called and verbally threatened, allegedly saying: "I'm going to come over and kill you." Rudd offered $200,000 and a choice of vehicles and house as payment to kill the assistant, according to reports. When police raided his home in Tauranga, New Zealand, they found methamphetamine and other drugs. "I was pretty stressed at the time," Rudd told Australia's "A Current Affair". Prior the ruling, the court was told that Rudd's actions were the result of psychosis, brought on by drugs. While he initially denied the allegations, he submitted a guilty plea in April. Under the sentencing, he will be monitored for eight months and required to complete a rehabilitation program. Judge Thomas Ingram told Rudd that there "was nowhere to hide" and that if drugs or alcohol were found in his system, he would face jail time. KROKUS singer Marc Storace says that he would "certainly" accept an invitation to step in for AC/DC frontman Brian Johnson, who has been advised by doctors to stop touring immediately or risk total hearing loss. The Maltese-born vocalist, whose band has opened for AC/DC in the past and who once turned down an opportunity to audition to replace the late Bon Scott in 1980, tells BlastEcho in a brand new interview (hear audio below): "It's amazing after so many years that this situation comes up again. It's really, really incredible." He continues: "As far as it concerns me, obviously there's my loyalty to KROKUS, but the guys would understand if the offer came and I would certainly take it up this time and go for an audition. Then it's up to [AC/DC lead guitarist] Angus [Young] to decide. For me, AC/DC is Angus Young — no offense to Brian Johnson. I think Brian Johnson did a magnificent job with his special unique kind of voice. But losing your hearing is not a nice thing. It's like losing our eyesight for a musician." The 64-year-old Storace tells BlastEcho that no one from the AC/DC camp has contacted him yet about filling in for Johnson, but adds somewhat cryptically: "I actually didn't even have to call Sony [both AC/DC and KROKUS are Sony artists]. They were already on the ball. This thing is not an easy thing to decide. I don't know what's happening and I don't wanna ask. I'm concentrating on my life and if they decide it's gonna be someone else, I'll continue with my life like I've always [done]." Storace admitted in a previous interview that he initially had some understandable reservations about being repeatedly compared to Scott, feeling he was being "branded as a copy of somebody who, at the time, I didn't even know that well." But he eventually started seeing things differently. "Today, I look at is as a big compliment. I think he probably had many of the same idols I had, and we were both gifted with the same vocal tonalities." Dave Evans est également "candidat"
Original AC/DC singer Dave Evans has told The Sydney Morning Herald that his fans would want him step in for the band's current frontman Brian Johnson, who has been advised by doctors to stop touring immediately or risk total hearing loss. "When I perform around the world the fans love my music and my performances and I hear what they tell me," Evans said. "That's what they all tell me. They're pretty appreciative of my vocals and performances." Evans had kind words for Johnson, who admitted in a 2014 interview that his hearing loss wasn't due to playing loud rock music every night for a living but was the result of Johnson's other obsession: auto racing. "A lot of people make jokes about going deaf from listening to loud music," Evans said. "It's never been a problem for me. "I just thought it was sad news. It's your lifeblood as a singer, live performances are so personal, without the crowd and the adrenalin, it's going to be hard for him. Performances are the big highs in our lives." Evans added that his return to AC/DC will probably never happen. But, he said, "it would be nice to do one guest performance. [Former members] were all part of the band no matters what era they were from." Evans also said that he though AC/DC could continue, even without Johnson. "So long as Angus [Young, guitar] is there in his uniform... it's a branding thing now, the name AC/DC is almost bigger than the [members of the] band itself. It's a massive thing all over the world." Evans recorded AC/DC's first two singles, "Can I Sit Next To You Girl" and "Baby Please Don't Go", before leaving to join Newcastle glam rockers RABBIT. Evans was replaced later in 1974 by Bon Scott, who sang on AC/DC's first six studio albums and became a legend himself after his death in 1980. Evans said he "never had a problem with Bon," adding, "He had an opportunity to take my place and become the singer for AC/DC. I would have done the same thing. Bon was a rock and roller and as hard as me... He was quite a few years older than me but we grew up tough and did the hard knocks." Evans told Wales Online that his former bandmates have not acknowledged his rôle in AC/DC's early history, saying, "They like to pretend in interviews that Bon Scott was there from the very beginning. The truth of the matter is that a lot went on before Bon became involved — in fact, the band had already got through two bass players, three drummers and a handful of managers by that point . . . all the stuff [Bon would] later do onstage with AC/DC, like taking off his shirt and carrying Angus around on his shoulders, was nicked off me." Cliff Williams a annoncé qu'il arrêtait sa carrière à la fin de la tournée actuelle. Ce serait lié aux récents évènements, c'est à dire la perte de Malcolm Young, Brian Johnson et Phil Rudd. AC/DC are losing yet another member. After founding guitarist Malcolm Young left in 2014 following a dementia diagnosis, drummer Phil Rudd split due to some legal difficulties and singer Brian Johnson had to step aside this year because of a battle with hearing loss, longtime bassist Cliff Williams has now announced that he's retiring. Speaking to Gulfshore Life for a feature about rockers who live in Southwest Florida, Williams, who joined the band in 1978, said, "It's been what I've known for the past 40 years, but after this tour I'm backing off of touring and recording," he said. "Losing Malcolm, the thing with Phil and now with Brian, it's a changed animal. I feel in my gut it's the right thing." Cliff Williams' decision comes just after the band played a string of European dates with Guns N' Roses singer Axl Rose filling in for Johnson on the band's Rock or Bust Tour. In August and September, AC/DC will perform in the U.S.
Faudra vite se décider pour la tournée de reformation. Williams previously told Gulfshore Life about his decision to leave AC/DC: "It's been what I've known for the past forty years, but after this tour I'm backing off of touring and recording. Losing Malcolm, the thing with Phil and now with Brian, it's a changed animal. I feel in my gut it's the right thing." The 66-year-old Williams is the longest-serving member of the group after co-founder and sole original member Angus Young. He joined the band in mid-1977 and made his debut on its fifth album, 1978's "Powerage", appearing on every record and tour since. Williams said about his long stint with the group: "When you start out, you kind of hope for success. That's what you are working for. But you never really know. It's been surreal, really." Assuming neither Rudd nor Johnson return, Williams's exit means that only Angus Young remains from the lineups that recorded classic albums like 1979's "Highway To Hell", 1980's "Back In Black" and 1981's "For Those About To Rock...We Salute You". The rescheduled dates of AC/DC's North American tour — which are the band's first concerts here with Axl Rose on lead vocals — kicked off in Greensboro, North Carolina on August 27. Angus Young has not indicated yet what the group's plans are following the completion of the touring cycle for the band's latest album, "Rock Or Bust". The final show of the North American leg of the "Rock Or Bust" tour will take place tonight (Tuesday, September 20) in Philadelphia, Pennsylvania. Angus reste le seul membre original. Vu ce que le groupe est devenu ces derniers mois, je lui souhaite sa fin. Si Angus a encore les doigts qui démangent, qu'il fasse un album solo, ce serait plus juste. Oui ou toi tu peux aussi passer à autre chose. Si vraiment tu peux pas faire autrement envoie-leur un mail. Petit comique, je ne viens pas cracher sur le groupe ni sur leur longue carrière, respectable bien sûr, comme tu viens cracher assez niaisement sur mon avis, qui est loin d'être un propos isolé. Leur carrière prendra fin un jour, et le plus tôt sera le mieux, au vu des tournants assez tristes qu'ont récemment vécu plusieurs des membres majeurs. AC/DC continue,tant mieux pour Angus et ses nouveaux acolytes, et tant mieux aussi, dans un sens, pour la frange de fans assez égoïstes pour souhaiter que la légende poursuive jusqu'à en crever (dans le ridicule selon d'autres fans, anciens notamment), mais je trouve, dans mon coin, sans science infuse, que la légende n'a plus besoin de cela. Ce n'est plus la fin d'un cycle, à ce stade-là. Angus veut un dernier album d'AC/DC, et une dernière tournée ? Eh bien, mon petit, qui suis-je pour lui donner tort personnellement ? Souhaitons-lui de réussir, un bon album constituerait une belle fin, certes. Ne soyons pas témoins, en revanche, d'une fin désagréable, pitoyable, avec nos preux ancêtres du hard métal trop mollassons sur scène, dont un qui clamse entre deux concerts (cf. Lemmy). Do we believe that Anderson’s recount of what Young allegedly told him is accurate? I don’t see why not. It makes all the sense in the world for AC/DC to continue with Axl Rose: Rose is likely to be done touring with GN’R for quite a while, the formula worked the first time around, fans were into it and we already have another reputable source claiming it’s happening. So: new AC/DC music with Rose on vocals in 2019? It seems likely. I’m not sure whether AC/DC fans care all that much about new music — it’s just a good excuse to tour, which is what everyone wants most — but having Rose in the mix would certainly make the prospect of new AC/DC songs way more interesting. We will, naturally, keep you posted. A voir mais sans le frangin malcom j'ai de sérieux doute...mais je peux me tromper. Pfoooouuuu !!!! Moi aussi. Disons que le futur projet solo d'Angus sera sous le nom d'ACDC. Ca remplira certainement encore les stades. Il fait bien ce qu'il veut ça m'est égal. Par contre je doute également de ses capacités à composer un album seul, mais il sera avec Axl qui est un songwriter assez génial quand il s'en donne la peine, je l'imagine mal ne pas apporter son grain de sel et on a pu constater qu'il a bien compris l'essence du groupe. Donc très curieux du résultat. En même temps ça fait 20 ans que le groupe sort de la daube donc ça changera rien ! Pour Johson c est cool. Pour Rudd bof... Slade assure davantage. On y perd. Brian Johnson a confirmé qu'il est de retour dans le groupe (via une histoire rocambolesque...). Brian Johnson has reportedly confirmed that he will appear on AC/DC's upcoming studio album. Rumors of the singer's involvement with a new AC/DC record have been circulating for several months, ever since he and drummer Phil Rudd, along with guitarists Angus Young and Stevie Young, were photographed outside Vancouver's Warehouse Studios. Based on the pictures, the assumption at the time was that AC/DC was in the midst of making — or at least planning — another album, with Rudd and Johnson both back in the lineup. Online reports have also indicated Angus Young will dedicate the new AC/DC album to his late brother. While AC/DC has yet to reveal any details of a new studio recording, Brian apparently let the cat out of the bag earlier this this week when he bumped into the American band TERRORIZER at an airport near his home in Sarasota, Florida. On Monday (January 28), the grindcore trio — which features in its ranks former MORBID ANGEL drummer Pete Sandoval — took to its Facebook page to recap the group's just-completed European tour. After praising the other bands on the trek and thanking its road crew, TERRORIZER wrote: "We ran into Brian Johnson from AC/DC at the airport today after the flight home and we asked him about the rumors of him being on the new AC/DC album and he said 'yes' and that he is 'sick of denying it.' So that was a cool surprise ending to the tour." Photographic evidence has emerged suggesting that bassist Cliff Williams is part of the rumored AC/DC comeback album which is expected to be released in the coming months. 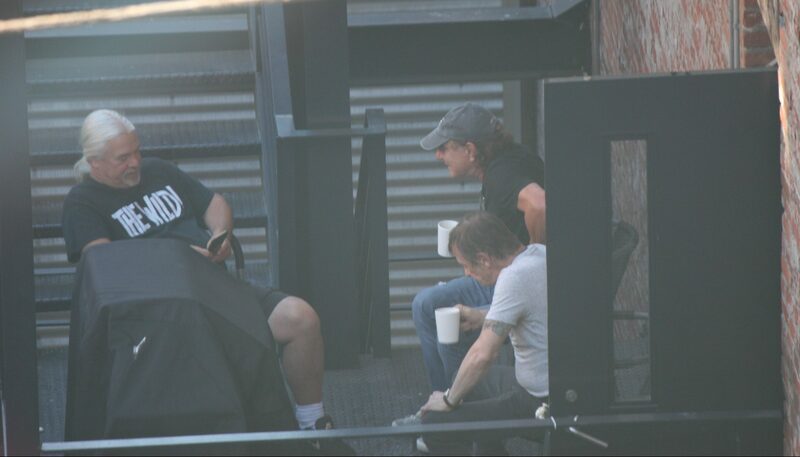 Last August, singer Brian Johnson and drummer Phil Rudd, along with guitarists Angus Young and Stevie Young, were photographed outside Vancouver's Warehouse Studios. Based on the pictures, the assumption at the time was that AC/DC was in the midst of making — or at least planning — another album, with Rudd and Johnson both back in the lineup. Williams, who announced his retirement from AC/DC more than two years ago, wasn't seen in any of the images from the Warehouse, leading many fans to speculate that he was not involved in the band's latest recording sessions. But a newly uncovered photo posted on the Instagram account of Canadian personal trainer Scott Frinskie places Williams and Johnson together at a Vancouver hotel while the studio sessions were taking place. The picture, which can be seen below, appears to have been taken at the Shangri-La Hotel around the same time — September 2018 — that Johnson recorded a video message congratulating Canadian rockers HEADSTONES on the 25th anniversary of their critically acclaimed debut album, "Picture Of Health". When Williams confirmed his retirement in an emotional video following the end of the group's "Rock Or Bust" world tour, he stated that it was "time" for him "to step out." His decision followed a string of personnel changes for the group that started with co-founding guitarist Malcolm Young's departure in 2014 after he was diagnosed with dementia. In 2015, Rudd was sentenced to house arrest after he was found guilty on a drug charge, while in early 2016, Johnson was forced to step down or face the loss of his hearing. Cliff acknowledged the numerous changes that the band had undergone in recent years, and noted AC/DC has been dealing with such tumult since the death of singer Bon Scott. "Everything changes, so it's not that," he said. "It's just, I'm ready to get off the road and do what I do in between tours." While AC/DC has yet to officially reveal any details of a new studio recording, online reports have also indicated that Angus will dedicate the new album to his late brother Malcolm. The latter passed away in 2017. Johnson left AC/DC mid-tour and was eventually replaced on the road by GUNS N' ROSES frontman Axl Rose.